Kerala is an evergreen lush state, tucked away in the southern corner of India. It is one of the most visited state in India. The state has its own tourism brand name - "God's Own Country", which has super-brand status. The state was named as one of the "10 paradises of the world" by the National Geographic traveler. 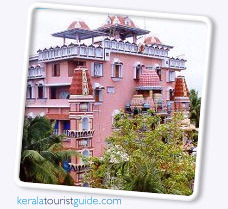 is a must for tourists wishing to experience a bit of spiritualism while on holidays in Kerala. The day dawns early in Amritapuri Ashram (monastery) located in the backwaters of Kerala. The roar of the Arabian Sea plays constantly upon one's ears, even as the temple bells chime to remind devotees about the chanting of the Divine Mother's thousand names The main idol at the Amritapuri Ashram is that of the fierce Goddess Kali. Carved in black stone, she has her red tongue hanging fearsomely out, while she holds in her hand a sword. It is said that Kali can hack off the ego with great ease. Once rid of this, the greatest impediment to finding inner peace, the devotee is on his way to attaining self-realization.